Background: Chin augmentation is the most common facial reshaping procedure that employs an implant to create its effect. Most people seek it to enhance the projection of the lower face as a stand alone procedure or as a complement to other facial procedures. (e.g., rhinoplasty) The outcome success is fairly high for chin implants, citing a 74% satisfaction rate on the patient website Real Self. But not all patients have the desired outcome they seek for a variety of reasons. One of the more common is that of an inadequate aesthetic result (not enough chin augmentation or not the correct type of dimensional change) or the realization that they desire a compressive overall jawline enhancement. The most powerful jawline augmentation effect comes from a custom jawline implant. To no surprise this is so because the total and connected jawline coverage of the implant which has a greater aesthetic impact due to the bony surface area covered. Designing a custom jawline implant in a patient who has an existing chin implant is actually an advantage and not a hindrance. In the required 3D CT scan used in custom implant designing the existing chin implant is both seen as well is digitally removed to create the new implant design. Also the known dimensions of what is both ‘right and wrong’ with the indwelling chin implant helps guide how a new implant design would offer aesthetic improvement. Case Study: This young male has a history of chin implant augmentation, which while providing improvement, still lacked the desired horizontal projection and was crooked. The existing chin implant had 9mms of central horizontal projection with a rounded shape. 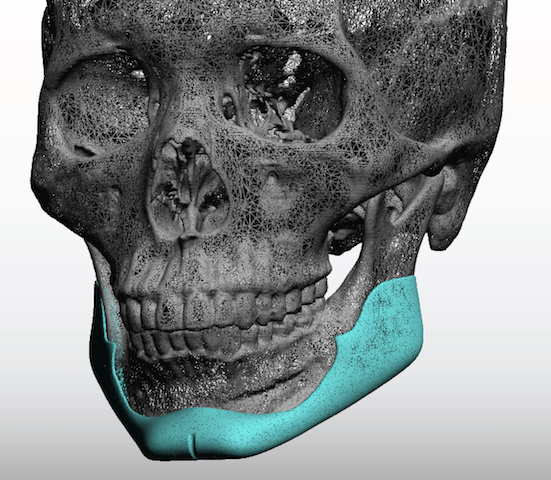 A 3D CT scan shows the asymmetric position of the chin implant. A custom jawline implant design was done that increased the horizontal projection of the chin to 15mms with a square shape. To prevent the jawline from become too wide, a thin linear connection was done back to the jaw angles which had a width of 7mms and a more defined jaw angle shape. Under general anesthesia and through his exiting submental incision, the chin implant was removed as well as all capsular tissue on the bone. Through intraoral posterior vestibular incisions, the subperiosteal jaw angle pockets were created and then connected to that of the chin beneath the mental nerves. The jawline implant was then placed as a single piece in a front to back placement technique. Double screw fixation was done at the chin and jaw angles. The placement of a chin implant, albeit initially successful, may ultimately create the desire for an even greater lower facial augmentation result. This unexpected aesthetic sequelae is actually not rare. While some patient jump in and go right fo a total jawline augmentation effect initially, others approach that end result either in a deliberate or unintended manner. 1) A significant percent of patients who present for custom jawline implants have existing implants in place. 2) Indwelling implants help guide the new custom jawline implant design. 3) How much extra chin augmentation can be obtained in any dimension is not limitless due to the tightness of the soft tissue chin pad and must be carefully considered in the new implant design.